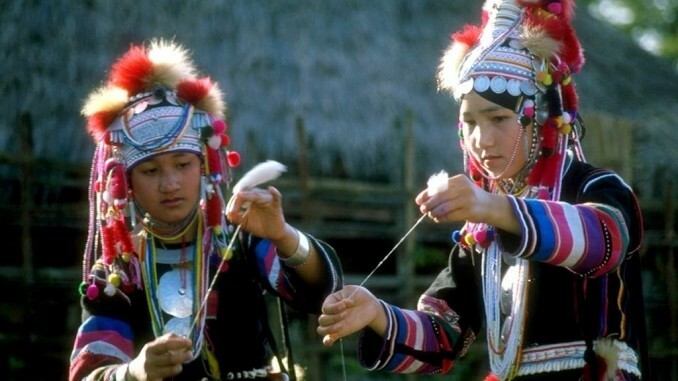 A country of 65 million people, Thailand hosts a great variety of ethnic groups. The large majority of the population is Thai or Isan, but there are also ethnic communities such as the Chinese, the Malay or the Khmer, and there are hill tribe peoples, each with its own customs and traditions. Going on a trek upcountry is a nice opportunity to discover these groups. Thailand’s population is relatively homogeneous, with more than 85% speaking a Tai language and sharing a common culture. This core population includes the central Thai (33.7% of the population), northeastern Thai or Isan (34.2%), northern Thai or Lanna (18.8%), and southern Thai (13.3%). Central Thai is considered standard, whereas Isan language is close to Lao. Northern and southern Thai have a particular accent and sometimes use specific words, but all are mutually intelligible. Most Isan or southern Thai speakers can easily switch to standard Thai if needed. Thailand is also a multi-ethnic country with more than 30 distinct ethnic groups, including the Chinese (about 14%, mainly Min and Hakka), engaged in business and commerce throughout the country, Malays, in the southern peninsula near the border, and Khmers, all along the Cambodian border. There are also numerous hill tribes, living primarily in the mountains of the north (Akha, Hmong, Karen…) but also in norteastern and central lowlands (Kui, Mon…), and in southern Thailand (Moken, Semang…). Number of people/speakers are for information only. Sources vary a lot, so it’s difficult to get reliable figures. Akha 80,000 in Thailand’s northern provinces of Chiang Rai and Chiang Mai at high altitudes (their villages can be visited by tourists). Also live in China and Laos. Karen (or Kariang) 400,000 in Thailand (Chiang Rai, Chiang Mai, Mae Hong Son and all along the border with Burma), the largest of the hill tribes. 7 million live in Burma, where they fight for independence. Lahu 100,000 in Thailand, in Chiang Mai and Chiang Rai. Also present in China (450,000) and Burma (150,000). Lisu 50,000 in Chiang Rai, Chiang Mai and Mae Hong Son provinces. Also present in China (730,000) and Burma (350,000). Central Thai (standard Thai) 20 million people. Northern Thai (Lanna) 6 million people in Lannathai, ancient kingdom in the north of Thailand around the city of Chiang Mai. Northeastern Thai (Isan/Lao) 21 million concentrated in the provinces of Khorat, Ubon Ratchathani, Udon Thani and Khon Kaen. Most people are of Lao origin, although the distinction between the Lao and Thai ethnicities is often blurred. Southern Thai 5 million people in the 14 southern provinces, from Chumpon to Narathiwat. Lu (Tai Lu) 80,000 in Chiangrai and throughout northern Thailand, also in Vietnam. Phu Thai 150,000 in Thailand, Phu Thai language is a dialect of Lao/Isan. Phuan 100,000 in Thailand, also very close to Isan culture and language. Saek 1,000 in Isan, near the border with Laos. Shan 60,000 in Thailand, 5 to 6 million in the Shan States of Burma. Tai Dam 700 in Thailand (Loei province), also live in China, Vietnam and Laos, and in the USA (as refugees). Hmong 150,000 in northern Thailand, mostly refugees from Laos where they fought against fought against communism. Yao 40,000 in northern Thailand (Chiang Mai, Chiang Rai, and refugee camps along Laos border), but mostly in China and Vietnam. Bru 25,000 in Thailand (northeast province of Sakon Nakhon), also present in Laos and Vietnam. Khmer Predominant ethnic group in Cambodia, 1 million in Thailand (Surin, Sisaket, Buriram, Khorat). 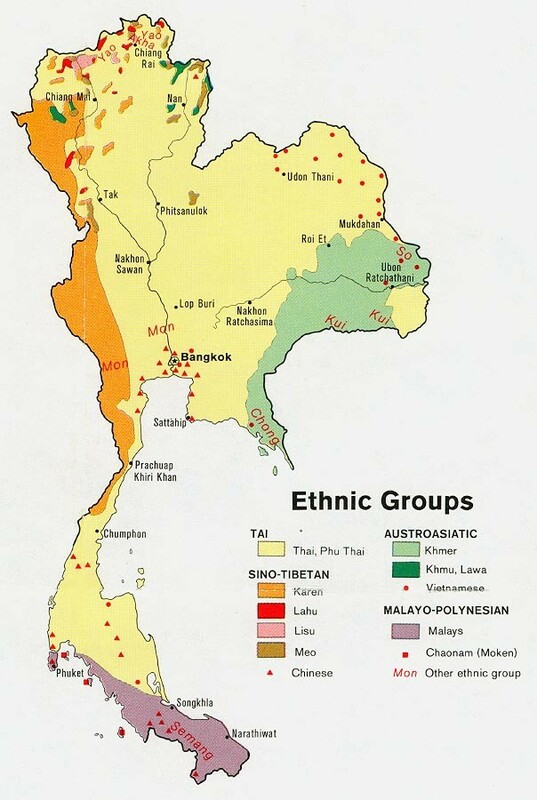 Khmu 10,000 in Thailand near Laos border, 450,000 in Laos (they were the indigenous inhabitants of northern Laos). Kuy 300,000 in northeastern Thailand (Buriram, Surin, Sisaket, Ubon, Roi Et). Lawa 17,000 in northern Thailand mountains. Lua 6,000 on Laos-Thailand border (originally from Laos). Mos (or Tonga) Spoken by Mani people (Negritos) in southern Thailand. Mon 115,000 in Thailand (around the southern Burmese-Thailand border), mostly refugees from Burma. Nyahkur (or Chaobon) 20,000 in Thailand (Central Thailand, Khorat), closely related to Mon (descendants of the old Mon empire). Palaung 5,000 in Thailand (called Di-ang in China). Phai 30,000 in Thailand (in Nan province but also in refugee camps), also present in Laos. So 50,000 in northeast Thailand (Nakhon Phanom, Sakon Nakhon). Cham Mostly in Cambodia (where half of their population was exterminated by the Khmer rouge) and Vietnam, only 4,000 in Thailand. Malay 3 million in Thailand, mostly in the south. Moken (Sea Gypsies) 3,000 in the Andaman Sea on the west coast of Thailand (Krabi, Phuket, Phang Nga, Ranong), well know for their knowledge of the sea. Urak Lawoi 1,000 to 3,000 (sources vary) in Phuket, also refered to as “Sea Gypsies”. The Padaung (a group of the Karenni people) live in villages set up to display them to tourists who are willing to pay to admire their particular body modification, which consists of coiling lengths of brass around the necks of the women. The origin of the tradition is not known. Mani people (Negritos) share common physical features with African pygmy populations, including short stature and dark skin, but their origin and the route of their migration to Asia is still a matter of great speculation. Because they are able to constrict their pupils to the smallest point possible and change their lens shape to the known limit of human performance, Moken children can see twice as clearly underwater as their European counterparts. The elders of this sea gypsies tribe ordered a hilltop evacuation just before the tsunami hit in December 2004, saving many lives. When I moved from Bangkok to Cha-am, in 2008, I was looking for a website with comprehensive information about Cha-am, but all I could find was a few lines mentioning the beach, mostly inside websites about Hua Hin. That's why I had the idea to create Onlychaam.com.